This post brought to you by AeroLife™ . All opinions are 100% mine. AeroLife sent us a product sampling package of their new smart air-based nutrition system. If you’re a consumer of vitamins, supplements, energy drinks or even COFFAY!, you might be interested in learning about the alternative, portable, no calorie energy and nutrition solutions that AeroLife has to offer. But what is AeroLife exactly and how is it different than the above mentioned products? Let’s take a look at the explanation straight from the company themselves. “AeroLife™ is an air-based smart nutrition system that delivers powdered blends of vitamins, supplements, and flavors. This patented and reloadable system is uniquely designed to work, fast, anywhere. 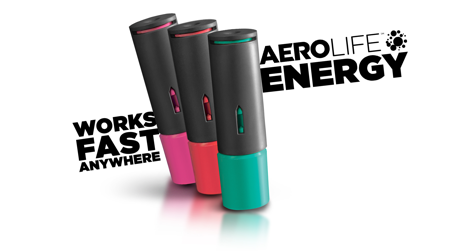 Essentially, AeroLife products provide nutrition, supplements, energy and flavors in powdered form, dispensed via a portable AeroLife container that is as easy to use as sipping a straw. This is cutting-edge nutrition technology, invented by Harvard professor Dr. David Edwards. By using AeroLife, you can skip the pills, the drinks and the other traditional supplement products for a more portable and more convenient delivery method. Watch the AeroLife product video above to learn more. To take AeroLife for a spin, I decided to try out their mint-flavored Energy product after lunch, eschewing my regular post meal time pick-me-up regimen of iced tea. I opted to try out the Mint flavor mainly due to the fact that it is exclusively sweetened with Stevia, a natural plant derived extract. The other energy flavors I received (Raspberry & Watermelon) also contained Sucralose, which I am not a fan of. As advertised, the AeroLife system was easy to use. 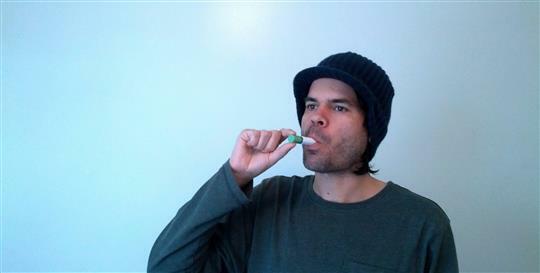 I popped open the cap by pulling on the reusable mouthpiece, assumed a straw sipping pose and then drew in air. This resulted in the powdered energy product being delivered to my tongue and mouth, exactly how the company described it would work. The overall flavor wasn’t bad and I definitely received a dose of fresh mintiness. One note on the product delivery mechanism; my first attempt at drawing in the powder didn’t quite work for me, but on the second try and thereafter, I had no problems obtaining a powder-packed punch. I could definitely feel the effects of the AeroLife Energy, so the caffeine was assuredly delivered to my bloodstream, making its mark on my mood and energy levels. My wife even asked why I was being so animated. A shot of AeroLife Energy, that’s why. If you’re intrigued by the unique AeroLife delivery system, take advantage of the free trial (12 pack of Watermelon or Raspberry) available only at AeroLife.com; Start your free trial now.